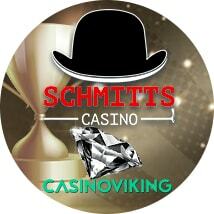 Schmitts Casino - Put on your black hat and join the Schmitts online casino! Put on your black hat and join Schmitts! When you first enter Schmitts Casino your focus will immediately be drawn to the photo of a dealer and roulette table. This is made brighter and more impressive by the black background on which it is set. This good use of a focal point that is simple in design but well executed makes the website seem very professional. It also helps you believe that you have made the right choice when entering Schmitts Casino. This focal point also acts as the banner for which the welcome bonus and signup buttons are located. Schmitts Casino offers a wide array of bonuses from free spins on slots, cashback, to 100% on deposits. Unlike most Schmitts Casinos promotions are changing all the time with special weekday deals, weekend deals, and monthly deals. There is a VIP loyalty scheme which offers you discounts, special promotions, and extra bonuses. The higher your loyalty level is the better the perks will be for you. As a result of the constant changes to the bonuses, we would recommend that you first check out Schmitts Casino’s promotional page before signing up. Schmitts Casino does not have a lot of games in the categories of Roulette, Live Casino, BlackJack and, Scratch. This may leave you disappointed if they are your go-to games. On the other hand, there is a very healthy and ever-expanding selection of slot games. The best feature on offer at Schmitts Casino by far is the handy information button on all their games. This button will tell you everything you would want to know about the game. Including who made it, how to play it and, what bonus it might have. Schmitts Casino offers 3 main channels of support, the first is an FAQ to help with basic issues. The other two options come in the form of a 24/7 live chat and a contact form via email. On the payment side of things, we noticed that Schmitts Casino use Olorra Management Limited to handle all their transactions. This means it will be their name that appears on your statement after a deposit. Schmitts Casino offers its players a wide range of options including credit cards, prepaid cards, and even some mobile device options. Finally, it’s worth mentioning that all these options come with terms and conditions. So be sure to read them before making a transaction. Overall Schmitts Casino is a very charming addition to the world of online casinos. With it’s bright and colourful banner, its white/yellow text on the black background and, its vast selection of slot games. It is also a very user-friendly website with its guides to help out beginners. The website is also very easy to use on a mobile device which will appeal to many players. The website does have some downsides like the rather poor selection games other than slots. There is also the issue of not being able to try any of the games without first signing up and making an account. We do feel that the positives do outweigh the negatives for Schmitts Casino. So if you would like to try Schmitts Casino out for yourself just click on the link above and from everyone at CasinoViking.com good luck and have fun. CasinoViking.com independently compares online casinos in the UK. The third parties may change or cancel bonuses and/or offers and CasinoViking cannot be held liable for incorrect information.